Summer heat is often best quelled by a dip into a museum. I recently found myself doing just that, in dim, terra-cotta colored chambers, acclimating to the cool calm of Lost Kingdoms at the Metropolitan. This stunning assemblage of over 160 sculptures and artifacts from the 5th through the 8th centuries are national treasures from Cambodia,Vietnam, Thailand, Malaysia, and Myanmar, celebrating the period when they were fluctuating kingdoms and cultures, just starting to embrace Buddhist and Hindu beliefs. At the entrance looms a sandstone Dharmachakra, or Wheel of the Law, the single most important symbol of Buddhist teachings. Representing Buddha as one who “turned the wheel of the dharma,” the imposing relic’s aesthetic lives up to its intent: to express devotion to the newly introduced religion. I am drawn into the chambers, already under a spell. Humble sandstone has never taken on such elegance as in these graceful depictions of Buddha, Vishnu, and their holy cohorts, while other artifacts such as lintels and steles muscle in with undeniable Southeast Asian mystique evoking the ruins of Angkor Wat and the scent of green papaya. Scale ranges from massive stone sculptures, terracottas, and bronzes to the small coins that document Indo-Roman trade in the early part of the first millennium. I realize that I had, in fact, viewed some of these very objects in their natural setting when I visited Vietnam back in 2003. At that time I had only the most rudimentary knowledge of Buddhism and Hinduism. I smile at the irony that it took them to come to me, rather than me to them, to appreciate their creative context as well as the forces of natural and spiritual migration. When the student is ready, indeed! Now, at the exhibit, I am curious about how this evolved. The region was already steeped in nature (or spirit) cults, whose animistic belief systems made for a foundation easily receptive to Indic ideas. Widely worshiped folk geniis (Yakshas and Yakshis, in Sanskrit), embodied the spirit of the land, rocks, rivers, and trees, or acted as chubby dwarfs decorating the bases of Buddhist monuments in deference to the new religion. The earliest surviving sculpture comes from 3rd-4th Century Myanmar (formerly Burma), and captures the hybrid rooting of Buddhism and Hinduism in the jungles of the spirit-cults. This Throne Stele, or ceremonial stone slab, measures 60 inches tall and 27.5 inches wide, and is believed to be the back of a throne. On one side is an empty chair, symbolizing the Buddhist tenet of impermanence, and on the other is a warrior with attributes of Vishnu, the preserver and protector of the universe, holding a club, while his two attendants wield a discus and the head of an eagle. I find it fascinating that both religions share this venue. Was it intended to cover all the bases of magical protection to the seated ruler? Or maybe faith was more fluid at this time, especially for people who still held their animistic beliefs close. How exactly was this religious immigration accomplished? Buddhist-inscribed steles found on the Malay Peninsula, a trading center, were erected as thanksgiving for a safe passage. They witness the role of Buddhist merchants in spreading the faith. Pilgrim monks carried easily- pocketed icons made of metal, wood, and stone: souvenirs from India’s most influential school of Buddhist art, the Sarnath monastery. Here is where Buddha gave his first sermon in a forest north of Varanasi. And here is where the pan-Asian aesthetic of ideal Buddhahood emerged, with an increasingly detached and otherworldly expression, diaphanous, body-defining drapery, and closely modeled curls. These images of Buddha and bodhisattvas served as templates for local artists to continue the visual branding that we recognize so easily today. 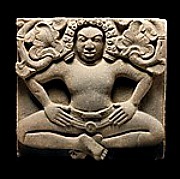 On the other side of the coin, or stele, no trace of Brahmanical imagery survives, indicating that the knowledge of images relating to Hinduism are likely due to itinerant Brahman priests overseeing production. In both cases, commerce in religious icons proliferated, and continued to help spread the faiths. Imagine you are on an archaeological dig in 1926 and stumble across a sandstone stupa with five Buddhas meditating, in carved relief. What you have discovered is the entrance to an undisturbed relic chamber filled with gilt reliquaries and glittering treasures, in short, the greatest Buddhist loot ever uncovered. This is known as the Khin Ba stupa mound, in Sri Kestra, Myanmar. Stupas were often enormous structures, as tall as 150 feet, that overwhelmed the villages whose funerary monuments they protected. They are amazing to look at here in NYC. [unclear whether this is your imagination at play or they are actually on display] Only the chamber cover described here is on display–it is not that big–5’ tall. Can we just eliminate the sentence you added? Other relics from that discovery on display here include a small silver Buddha with a tiny lotus pattern engraved on the sole of his foot, as well as faithful models that served as containers for sacred texts. At the opposite end of the scale spectrum is a stone relief of Rishis, sages of the Vedic traditions who rivaled Buddha, depicted here as being distressed that their beliefs have been overturned. Southeast Asian rulers were highly receptive to Hinduism, embracing Vishnu, the hero warrior, as an ideal role model. That this religion could co-exist with Buddhism throughout the many “lost” kingdoms may be one of the most important messages to be gleaned from this not-to-be-missed exhibit. And I emerged into the warm sun, having strengthened the connection between the dots in my own spiritual travels.